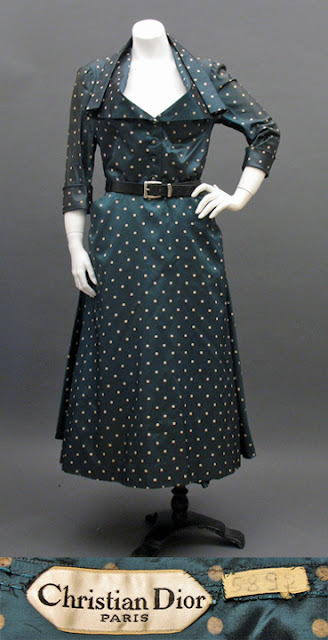 Recently, a real treasure, a petrol blue polka dot 2 piece dress from the 1948 Christian Dior Envol line, arrived at Past Perfect Vintage. And I am delighted to announce it has already found a home in The Fashion History Museum of Cambridge, Ontario. It isn’t the first piece the museum has acquired from Past Perfect Vintage, but it is certainly the first Dior. Jonathan Walford, the Curatorial Director and Co-Founder of the Museum agreed to talk with us a bit about the accession. Jonathan, the phrase ‘museum worthy’, or a variant of it, is very popular among vintage fashion sellers. What actually makes a garment of interest to a museum collection? All museums, regardless of what they collect, strive, or should strive to collect the best examples they can find. It is the curator's job to use their discernment in acquiring artifacts for the permanent collection and not just take everything that is offered. The Fashion History Museum is always looking for exceptional examples of fashion, but fashion doesn't mean only Parisian couture - it applies to all forms of dress, even humble garments. So a wide range of garments can be of interest, but I am always looking for the examples that are the most artistic or are typical of the most important designs, in the best condition and have the most complete provenance. You must see many garments and accessories you would like to add to the Museum’s collection. Why this particular dress? What is its historical importance? I see many many things I would like to add to the museum collection, but I can't always add what I would like due to space and funds - I have to acquire what will ultimately benefit the museum collection the best. If you were to ask most fashion-savvy people who they felt were the two most important fashion designers of the 20th century I would guarantee you the top answers would be Chanel and Dior. They are the two longest operating couture houses still in business and have had a long lasting influence on fashion design. 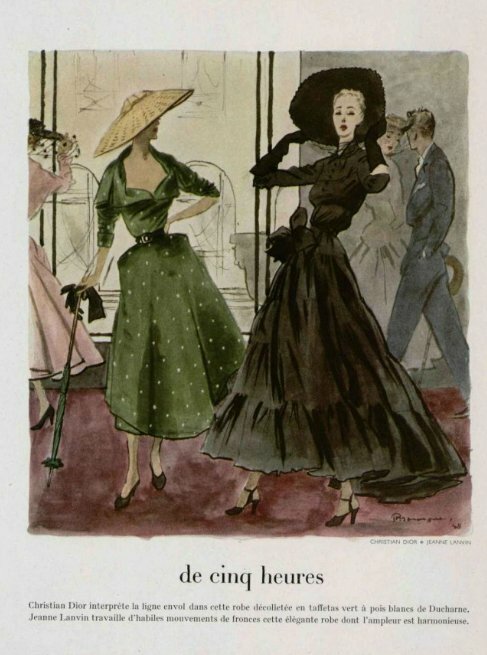 Dior's famous 'New Look' collection of spring 1947 was an event in fashion history that marked the end of one era and the beginning of another, like the miniskirt did later, in the 1960s. This dress is from spring 1948, a year later, when the New Look fashions have become mainstream and Dior, still promoting his ideal silhouette, is beginning to play with the details to give his look a newer, fresher style. In other words, with everyone now doing New Look silhouettes of long, sweeping skirts, nipped waists, and soft shoulders, Dior was looking for ways to make the the now mainstream silhouette uniquely his, and he does that by pulling the skirt tight across the hips at the front, sweeping the fullness to the back, and playing with an informal open neckline that doesn't look overly worked. It's a clever way of putting a spin on the style. The Fashion History Museum has quite a collection - some 8000 garments and accessories. Where will this example of Dior's work fit into your plans? We have three other Dior couture dresses, from spring 1958, spring 1961, and spring 1962, as well as four Dior New York suits and coats from the early 1950s, three Holt Renfrew Dior dresses from the 1950s, and one Dior London cocktail dress from the late 1950s, plus later, boutique and ready-to-wear Dior. This will become the earliest Dior, and the earliest couture Dior in our collection. The next item is a Dior New York suit from about 1950 or 51. It may not be enough to mount an exhibition on Dior - yet, but some day, it would be nice to be able to do a retrospective exhibition of that company's work. Speaking of which, are there any upcoming exhibits we should be on the lookout for? This fall has been really busy for us, we have 12.12.12: Life in Three Centuries, which is an exhibition about fashion and pop culture in 1812, 1912, and 2012. We also have Nuclear Fashion: Selling Style to Suburbia, which is a survey of fashion advertising between 1946 - 1964, as well as an exhibition of winter sports fashions from the 1920s - 1960s that will be on display at our local Grand River Film Festival next week, and we are opening our exhibition on the history of underwear in January entitled 'Waist Management' and are in discussion about creating a wedding dress exhibition that will be travelling to Dubai in 2013 or 14, so there is lots going on! Jonathan is also is the author of The Seductive Shoes: Four Centuries of Fashion Footwear, Shoes A-Z: Designers, Brands, Manufacturers and Retailers , Forties Fashion: From Siren Suits to the New Look and Ready to Tear: Paper Fashions of the 60s. That’s four books since 2007. Any chance a new work is on the way? A book by Shire, 1950s American Fashion, is going to be released at the end of this month, and I am working on the editing of a book about 1960s fashion that will be released around this time next year. Many thanks, Jonathan, for taking the time to talk to us about a great dress. A fascinating read, and how wonderful that the dress is going to a museum collection. I hope to see it in person someday. How wonderful that this gorgeous dress stayed both "in the family" (so to speak), AND where we can all see and appreciate it! Jonathan's museum is on my short list of must-visit destinations. It could not be going to a better home. Well done, both of you!